I’d love to meet you, too, Nicole! Hopefully someday soon! My goal was to not bring my 8 month old daughter back to bed with me when she woke during the night. Instead, I wanted to completely get her back to sleep and in her crib before I returned to bed. Through setting this habit into motion, she is waking less often and we are all getting more sleep. I feel like I’m responding to her needs better since I am awake and aware. It also has provided me with extra prayer and reading time. It’s been hard, but a good change! This is one of the best series you have written! It is so specific and practical. I love it. Focusing on one area really does spill over. When I am disciplined about exercising every day, I make better choices with my food and am just generally nicer to be around (that’s a huge bonus for everyone in the family!). I took the challenge to have the kitchen cleaned up every night before I head off to bed. This has helped my mornings run so much smoother. It’s one less thing on my “to do” list. I don’t wake up feeling “behind.” I love to walk into a fresh start everyday. But not only has this one challenge been beneficial to me, it has been a bonus to the rest of my family as well, especially my husband. Now, if I can just move to the next room for another 21 days 🙂 Thanks for the inspiration, Crystal! Hope it’s encouraging to someone! Mine was to keep up with my healthy eating plan by writing down everything I eat. Well, thanksgiving day, that did not happen. The other days though, I did great. By doing this though, I encouraged my husband, started a better regime with menu and grocery planning, plus, I started exercising some! Thank you so much for the encouragement! My goal was to read to my children before bed. There were a few days we didn’t do, especially with late nights around Thanksgiving and company. But i’m happy that we do this consistently now. The side benefit is that we are in a better bed-time routine, as they really want to get pajamas on and their teeth brushed. Thank you for the push to do this. Now if you can help me with my 20+ loads of laundry each week being caught up! Carrie, I read a book recently called The Reading Promise, which is all about a father and daughter and the journey to read together every night. It’s a very sweet story. 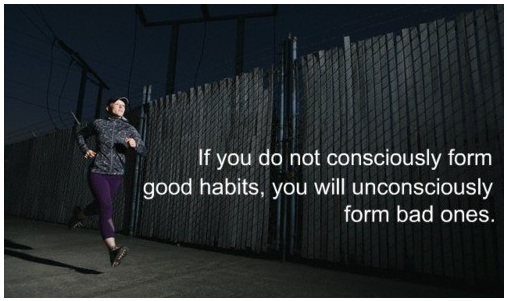 If you start one new good habit every 21 days, that is 17 per year. That is a lot! Congratulations on your tremendous accomplishment! My goal has been to set weekly goals and to get up earlier. One thing you reminded me in this post is to remind myself of all the reason WHY I have this goal an all the benefits I have gained from working toward it. I have really seen a big difference as it has helped me to be more focused and feel less frazzled during the day. The kids are small such a short time and I’ve been enjoying them more rather than feeling like I’m just rushing to the next task while trying to keep them busy. Thanks so much for the inspiration! I love this series! I have been focusing on getting up with my husband at 3 AM when he gets ready for work, which of course means going to bed pretty early as well. My challenge has been not going back to bed when he leaves, but I am starting to LOVE my alone time in the morning! I need it! Thanks for the encouragement in your blog, especially this series! Picking the right habit to form helps counter the discouragement of slow progress. If one picks a habit that has only itself as a benefit (say, floss teeth twice a day), then one gets only one benefit. If one picks a habit with many additional benefits (getting up early, daily exercise) then one has a long list of benefits to think about when working on forming the habit. So true! I get up early too, at least an hour before the kids. And all that you said above is true for me as well. If for some reason I don’t get to get up early (rough night with the toddler, sickness), etc, I feel off all day, as if I had lost two hours. Honestly, I haven’t worked on any goals per say. However, I still say the Dunkin Donut saying–“time to make the donuts” and now I think of you too when I struggle with getting up. The day just all around seems to go better when I get up early. I am not rushed. I love not being rushed in the morning….thank you for this post. It has helped me to NOT justify why to stay in bed. Have a great day. I’ve really enjoyed this series – thanks for sharing it Crystal! This is so true! My goal was to take a shower each night before bed (instead of in the morning) so that I could take time for myself in the morning. Getting the right start to my day has just made everything go smoother around the house. Then when I get to work I feel like things are going so much better because I’m not distracted with a million things that are undone at home. I never liked the term work life balance, but I think through this challenge I might have found it. Thanks for this series, Crystal! Your blog is such an encouragement to me! My habit was washing all the dishes, pans, etc after each meal. That habit is not very well-established. Over Thanksgiving weekend, we were painting our kitchen, living room, and foyer. I only had sink access at certain times, often my husband needed me to do something else right after a meal, etc, and then I got sick so I haven’t been keeping up with things well. So, after a week off, the habit is rather weak. Going to dive back in today! But, I definitely did notice overflow. With the counters and stove rarely having dirty dishes/pots on them, I was cleaning them more frequently. Because I did the dishes right after eating, when I got up to do something an hour later, I could move on to other tasks, so I got more done in general. It’s funny how each of us is different. The 8 of us have about 6 loads of laundry a week including everything but diapers. I don’t like doing laundry at all. The thought of having it all to do once a week, or even half of it twice a week just overwhelms me. So, I do one load almost every day, sometimes two loads, and my kids do almost all of the folding and putting away. Makes it much more manageable for me. With the exception of Thanksgiving and the day after, I’ve been keeping up with clearing off the kitchen island, dinner table, and the landing going upstairs. I can’t believe how I’ve kept up the landing!! I’m so happy with that. This series has been so beneficial for me. It’s also opened my eyes to more habits I want to form…. maybe we could do one a month, with a post from Crystal every few weeks? :) Just an idea! I know I could use it. My habit was to have the dishes done or in the dishwasher and kitchen counters clean before bed each night. I’ll admit that this hasn’t happened a couple nights but other than that it has. It has been wonderful to start the day NOT feeling like I am in the negative on housework. It has also made me more conscious of having the girls/myself clear the table quickly and picking up after ones self in the kitchen. It is also starting to spill over in other areas. A little over a week ago I decided to do something totally different with the laundry by having designated baskets upstairs and this is working out well. The girls even took it upon themselves to take their basket down and wash their own clothes when it got full. Finally just 4 days ago the urge hit me to FINALLY start keeping track of what I eat again. I found a free website where I can calculate all of my intake and keep track of where I am at. Just 4 days in I am feeling better and looking forward to shedding some of these unwanted pounds. I know that I still have many things on my list of habits I want to change but I am thrilled with the changes that are already being made. I am also very excited that once I start to realize I can accomplish “such and such” it makes me want to come up with a solution to accomplish the next thing. I really want my first activity of my day to start with reading my Bible. My days seem much more relaxed and at peace when I do. Another goal is to find a breakfast recipe that will only take a few minutes each morning, so that I can enjoy it with my husband. Did you ever finish the 31 weeks to a better grocery budget series? Thank you for sharing your heart through this series. I have been reminded and refocused on some of my goals-like cleaning the kitchen before bed, or going to bed at a decent time-thanks to reading this series. By the way, I love that you use the word “children” and not “kids”. I use “kids” all the time, but “children” sounds so much more loving! Discipline is SO important in life – whether just getting through the day, or in budgeting! Kudos to you for adopting these positive life changes. Great post! I love this installment to the 21 Days series. It is very motivational. You did a great job encouraging us, your readers, and have encouraged me today to re-commit to starting to make the positive changes I need to make in my life – one step at a time. Since I became a personal finance blogger, all I write about is budgeting, money, and working from home. So my thoughts are definitely focused on maintaining good spending habits. It’s not easy though! Blogging about what I spend vs. how much I earn keeps me honest. Great article – love your site!